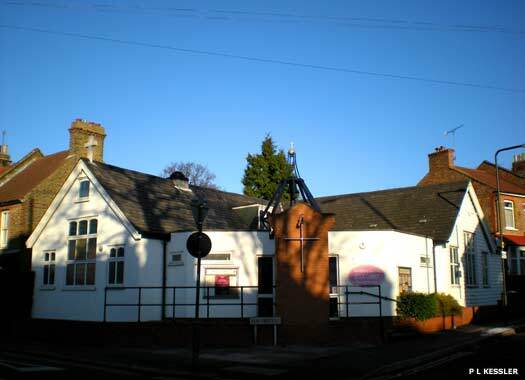 Woodford Green United Free Church is on the western side of High Elms. It began as an independent Wesleyan church in a small 1798 chapel on Mill Lane which was originally Woodford New Congregational Chapel. Internal dissension in Woodford Green Congregational Church saw a third of them join the Methodists in 1875 to form Woodford Union Church. When the Congregational church was lost in 1944, the remaining members joined to form the present church. St Andrew's Mission Church is on the north-eastern corner of Chingford Lane and Elm Grove, Woodford Green. Part of the parish of All Saints Woodford Wells, it originated about 1880 with services held in the Working Men's hall (the old Congregational chapel) and, by 1882, in a rented room in the Square nearby. An iron church was erected in 1888, and in 1923 the decayed iron was stripped off the wooden frame and the present building put up around it. 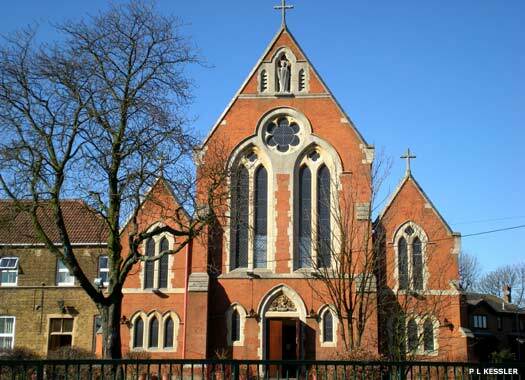 St Thomas of Canterbury Catholic Church, Woodford Wells, is at 557-559 High Road, in a parish formed in 1894. The red brick church with stone dressings and the Franciscan friary adjoining it to the south (on the left here), were built in 1895 at the expense of Henrietta Pelham-Clinton (died 1913), dowager duchess of Newcastle. The duchess occupied a house called the Oaks, immediately north of the church, which in 1920 became the convent of the Poor Clares (Colettines). 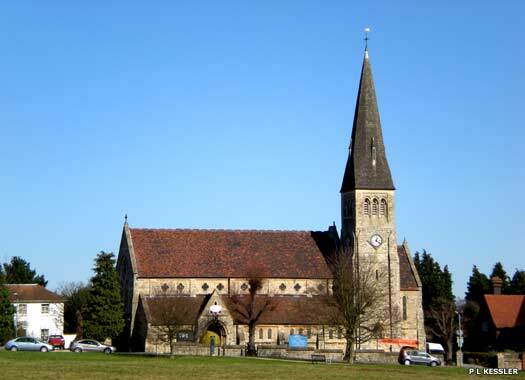 All Saints Woodford Wells lies on the northern side of Inmans Row, overlooking the green. The land here was donated by Henry Ford Barclay who lived at Monkhams, a grand house that was demolished in 1930. 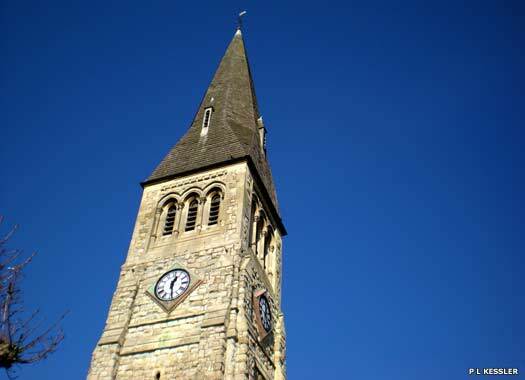 The stone church was completed in 1874, to a design by F E C Streatfield in the Early English style, with a chancel, nave, south aisle, north transept, and a north-east tower with a shingled broach-spire. The advowson of the vicarage is held by trustees. The tower's distinctively slender spire creates a focal point across the green and a scenic view that has changed little since it was built. In 1875 a consolidated chapelry was formed from parts of the parishes of St Mary, Woodford, and St Peter-in-the-Forest, Walthamstow. In 1876 a north aisle was added and in 1885 a choir vestry. A separate ecclesiastical parish was formed in 1906. Originally there were no endowments and the incumbent was dependent on pew rents. 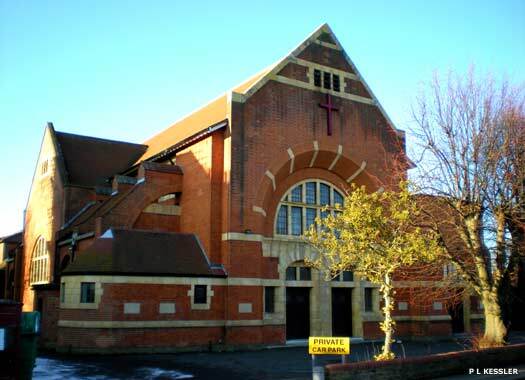 Woodford Wells Ecumenical Church is located on the grounds of Bancroft School which is on the western side of High Road Woodford Green. 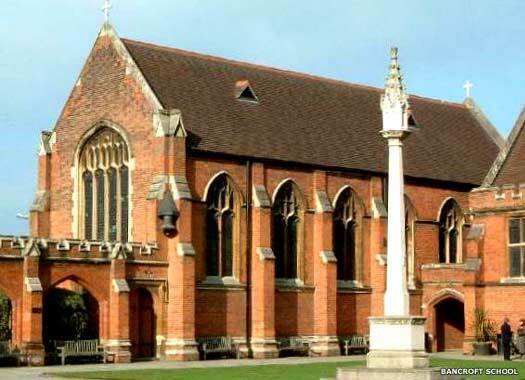 Although the church's independent nonconformist organisation has no direct connection with Bancroft School, the governors have given them permission to rent the school chapel since their foundation, although just when this foundation occurred is unclear. 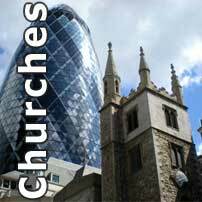 The church offers services in either Anglican or Nonconformist styles.